Blood & Truth is a VR game for PS4 from the London Studio. My playthrough started off where the new trailer revealed during last week’s State of Play begins. Seated at a table in a rusty abandoned building, facing a government official who reads a laundry list of his supposed misdeeds, Marks is keen to set the record straight. From there I was dropped into a mission from Marks’ Special Forces past – infiltrate an enemy base, rescue a fellow soldier, then blow that popsicle stand. Traversing the desert base was smooth, with indicators popping up allowing me to move forward or strafe. Creative Art Director Anthony Filice says this guided movement is intentional — Marks is a Special Forces soldier with a trained sense of infiltration strategy from the get go. Exploration is still encouraged, like looking behind crates or pulling open desk drawers for ammo or other secret collectibles. What makes the game so delightfully immersive is how natural the weapons feel. At the beginning of my playthrough I calibrated the camera so the gun holster appeared at my waist, allowing me to simply move the Motion Controller down to my hip and squeeze the trigger button to draw my weapon. Similarly to reload, I raised the other controller to my chest where the ammo pack was strapped, pressed trigger, and then moved to slap the clip into the bottom of the handgun. Y’all, I cannot stress enough how deeply satisfying that slap is. Moving through the base and taking down enemies felt exciting, but quickly slamming a fresh clip into my pistol put a wacky smile on my face. It’s a small mechanic in a larger-than-life game, but it made me feel like a real part of the world in a way that no other PS VR game has before. Action! Adventure! Espionage! Explosions! London Studios’ blockbuster game has it all. I’m the least excited about this of all the PSVR games announced for 2019, but the London Heist demo was pretty cool, so I could see a full game based on that fairly fun. 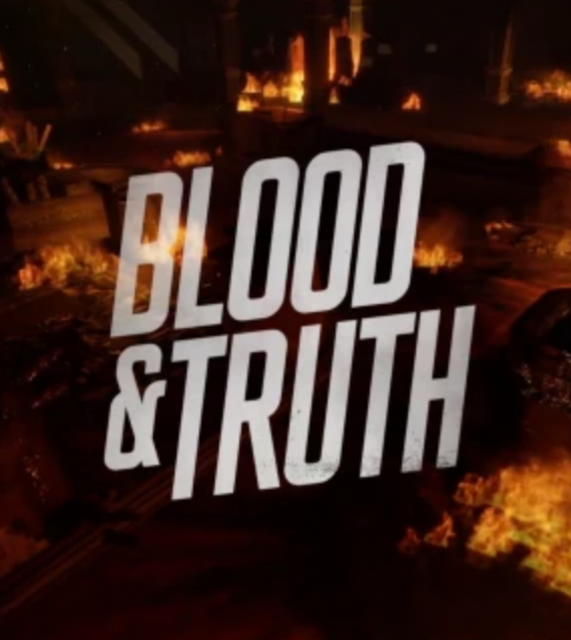 At its core, Blood & Truth is a first-person shooter. You’ll run across rooftops gunning down thugs, blow open doors with explosives, take out a warehouse full of criminals, and survive a high-speed car chase, to name a few. In typical VR fashion, though, it’s not just the frantic, video-gamey stuff that’s super fun to execute; VR manages to also make seemingly mundane things like picking a lock, opening a car’s glove compartment or flinging a clipboard across the room totally interesting, too. One of my favorite moments in the demo was sitting shotgun alongside my in-game partner and firing at bad guys as we drove and bantered, like some sort of vintage buddy cop movie. It made me want an entire PSVR game centered around two friends on a road trip. The controls were tight, for the most part. Aiming and shooting felt great, as did reloading my gun (by motioning to push a clip from my left hand into the bottom of the gun in my right hand) as well as strafing, pushing forward through the games’ increasingly chaotic set pieces, and holstering my weapons when things calmed down. Only when I ended up dual wielding a handgun and a submachine gun during a highspeed car chase - and subsequently struggled to reload either gun without a free hand - did things get a bit cumbersome, but that was probably entirely my own fault for being ambitious. 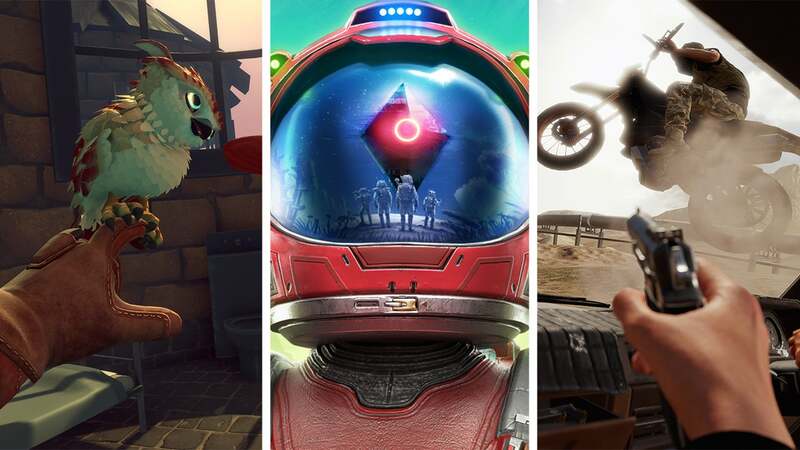 IGN went hands-on with a host of upcoming PlayStation VR titles that you should keep an eye on in the weeks and months to come. You can basically go from cover to cover point using the PlayStation Move controller. You can also move side to side using the X and O buttons on the Move controller. It definitely feels like a different game to The London Heist in these moments and I’m not sure if I loved these specific parts as much as the massive set pieces where you’re stuck to the one spot taking out enemies, but they were still fun to play through and required a decent amount of accuracy using the gun sights. As with The London Heist, the shooting mechanic still feels phenomenal and is one of the best experiences you can have in VR. There’s some pretty clever things being done with the PlayStation Move controllers. For instance, reloading is still done by putting your left Move controller up to the bottom of your right hand (although it feels much smoother than it did in The London Heist). You also essentially pull out your pistol by putting your PlayStation Move controller to your hip, or grab your assault rifle by reaching over the back of your shoulder, so there’s some more realistic movements that work well on-screen and add to immersion. There were also several times where I’d use both my PlayStation Move controllers to picklock open a door. At first it felt a little bit clunky, but this was probably because I wasn’t really expecting the game to use such intricate details, but once I got the hang of it, it definitely worked, which has me excited to see what other mechanics the game will hold. I have seen several versions of Blood & Truth over the years, as Sony’s SIE London Studio has been making the game for a long time. It was originally based on The London Heist demo on the PlayStation VR Worlds disc. You mimic the motions of holstering, pulling out your weapons, loading them, and shooting as you would do in real life. The whole idea is to be an action hero in a full-fledged game in VR. Blood & Truth debuts on May 28 on the PlayStation VR as Sony's big entry for a narrative action game in the new medium of virtual reality. I asked Iain about the movement system being used, and in order to limit any VR user side effects, he said they employed a system that gives you set points to work from with a quick movement system. You can strafe between some of these during a firefight, but most are point-and-click spots that you’ll move to as needed. The system worked very well and allowed me to take out the bad guys safely while staying in cover and popping out to shoot. Movement transitions were very smooth and gave the game military like precision when it came to advancing on the enemy. That military precision can be explained by the fact that they had an actual SAS soldier advising them during the development process. That same soldier also helped with terminology when it came to the script for voice actors, and hearing the chatter between your character and the soldier you rescue bears this out. The studio also had a Hollywood consultant to help create the overall game script, so that should make for a great story. 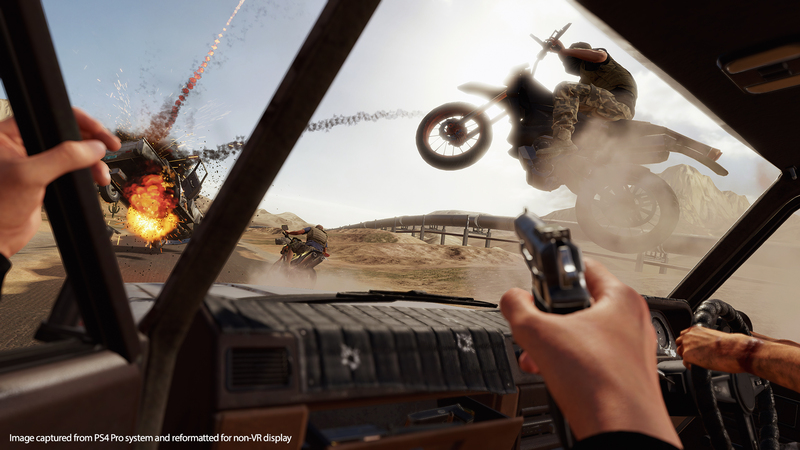 We went head and hands on with Blood and Truth on PSVR to find out just what being an action hero is really all about.